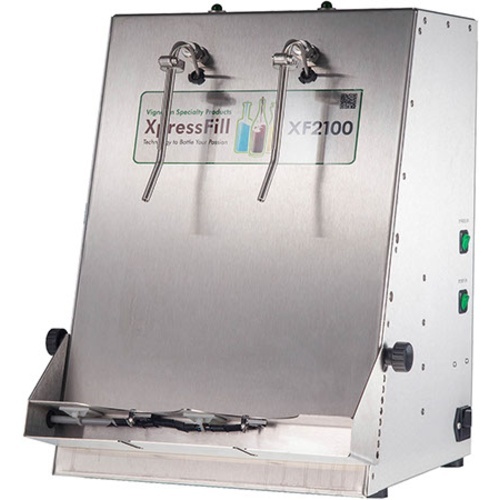 The Variable Flow Control Option for the XF2100 Level Filler from XpressFill is an optional feature that can be purchased at the same time as the filler. This option allows you to speed up or slow down the rate at which the bottles are filled based on the needs/capabilities of your production line, as well as those of your product. This option also boosts the fill rate to a whopping 400 bottles per hour! Features special fill nozzles to eliminate foaming of the wine as it is filled to reduce oxidation and the amount of time that the filler is recovering from foaming and performing top off. The Gas Flush option for the XF2100 Level Filler from XpressFill is an optional feature that can be purchased at the same time as the filler. This option allows you to connect your nitrogen or argon tank (not included) directly to the filler. When a bottle is placed on the filler it is automatically sparged with inert gas, then filled. There are no extra buttons to push or levers to flip and no table-top system for bottle flushing is needed. If you're looking for a fast, gentle, reliable, professional quality fill for your wine, then this is the filler for you. Hand-made to order by XpressFill in southern California, these fillers represent the very best available to home winemakers. This filler features a built-in self priming diaphragm pump to draw your wine from your tanks or barrels up to the filler. The action of the diaphragm pump is non-aerative and gentle, and it has the capability of pulling your wine from quite a distance away. The nozzles on XpressFill's Level Filler are independently actuated by microswitches when a bottle is put in place for filling. Flow stops automatically at the preset fill level. This makes it easy to put half the bottles on for filling and take the other half off for corking without having down time in between. The bottle shelf is adjustable in height to accommodate a wide range of bottles. Add the optional Gas Flush System and the filler will automatically gas-purge your bottles prior to filling. There is no additional button to push or lever to flip, the filler handles it all!